Today during my lunch break I visited the Hollywood Forever Cemetery. It was dreadfully hot, hot enough that I thought the air might accrue a stench of rot. I wonder if it ever does. Though it’s November now, today has been rather summery. The grass in the cemetery is mottled with brown from our lack of rain and the palm trees stand still like pillars in the absence of wind. There are a few spots of shade but even these were radiating. The only coolness I found was when I ascended the marble steps into the large mauseoleum. 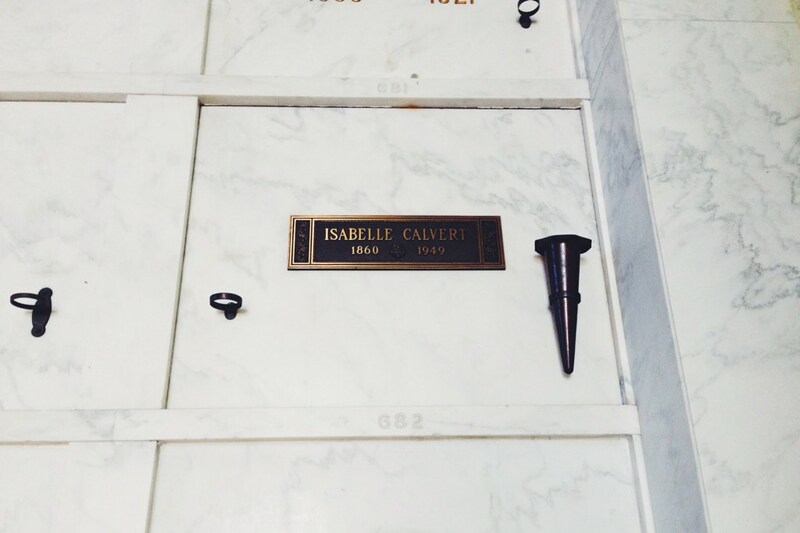 Inside, I found an interesting tomb, of an Isabelle Calvert, interesting because on her plaque was an inverted pentacle with a goat’s head in the middle, which is a symbol of the Satanist church. It struck me and I stared at it for a while, and wondered who this woman was and what she believed. Then I wandered outside again and walked by the water, and passed by a few graves that had been freshly adorned with bright marigolds and orange votive candles and colorful streamers for el Día de Los Muertos. On the way out, I saw an older man change the flower pot at his wife’s grave. Then I walked onto the gum-covered asphalt and made my way back into the hot heart of Hollywood, where the living hunch themselves over on wooden desks and give their eyes to silver screens.